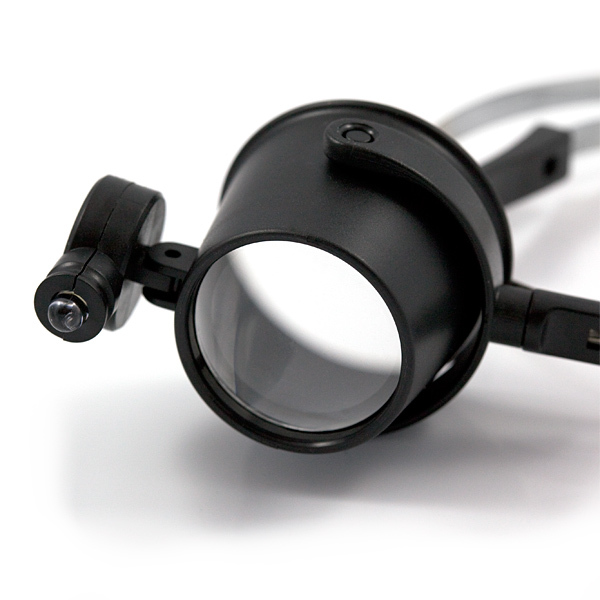 When working with small parts, sometimes you need magnification and some extra light. This is a monocle we use regularly in our production facility. 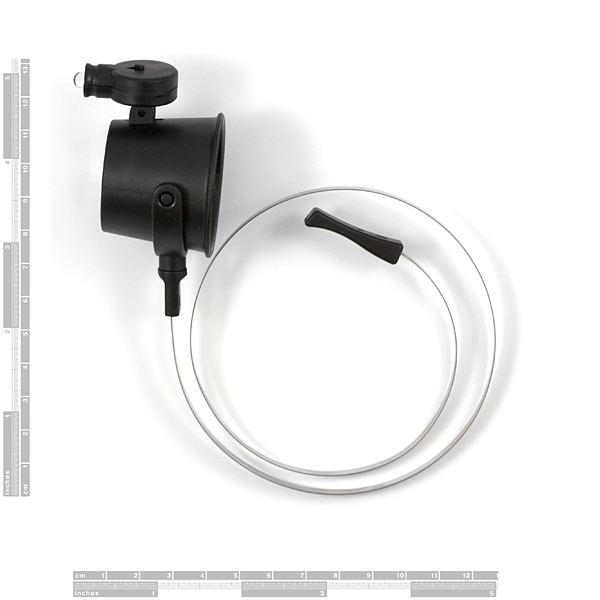 It has a 10x lens with a working distance of about 1-1/2". 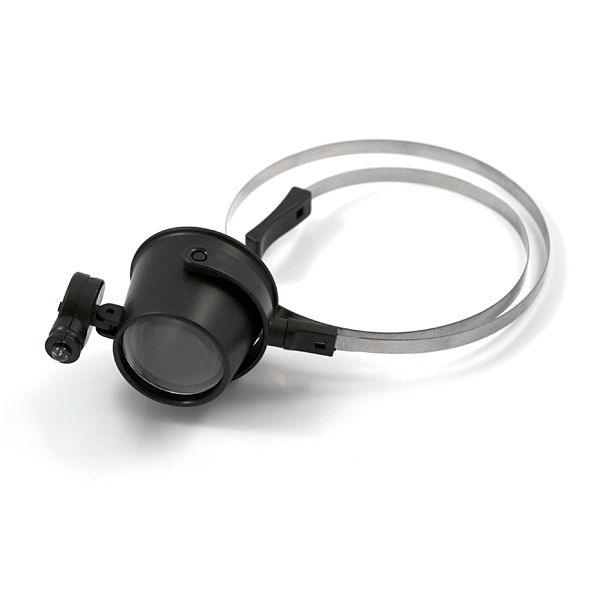 The 1" diameter eye piece fits snugly around your eye with a 15" aluminum-core headband. The LED provides sufficient light at the working distance. 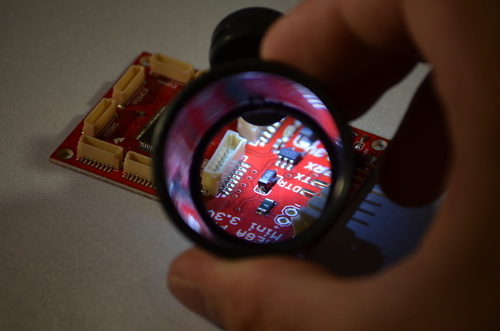 The monocle is for inspecting your solder joints and SMD components on a PCB. The LED provides sufficient light at the working distance. Be honest; how many of you have replaced the LED with a laser diode so that you could be more Borg-like? It's okay, we're all fr--Borg. Lower your shields and surrender your ships. We will add your biological and technological distinctiveness to our own. Your culture will adapt to service us. Resistance is futile. Go to a Chemist (Drug Store) For about $8 you can get 5x readers (glasses (spectacles)for old people) - These give you perfect stereo soldering vision for SMD. a working distance of 1.5 inches??? I can understand using it for quality control inspections but How does this make soldering easier? I really dont like this product. I expected to be able to wear it, and use it for precision soldering work, but the headband is uncomfortable, and the focal point is around 2 inches from the board. My advice is to find something else, and use this only for inspecting joints. Don't expect much for $10. The lens is awful. Distortion. I can't believe Sparkfun uses it on a production line. Maybe I can find a good lens to swap into it because the headband and light are pretty good. I just got back from the Sparkfun SMD soldering class. I used one of these for 30+ minutes off and on to INSPECT my joints. I wear glasses but found for inspection it worked well. The focal length was probably about an inch or so away from the lens. But even with my bad eyes I was able to get a clear crisp view. The led light was particularly nice, it actually worked well to illuminate the viewing area. I took the head band off, it easily pops off and on. I removed my glasses, held the loupe to my eye, and positioned the board as desired. Crisp images with excellent detail. The down side is it is completely plastic doesn't have a very sturdy feel. It wouldn't surprise me to see the LED busted off or the loupe cracked. For 10 bucks it's probably not a bad deal (although you can find them cheaper with a little leg work) but I wouldn't expect it to last a lifetime. Awesome product... until you drop the loupe, the LED holster cracks open, then you realize its impossible to fix it because its a cheap plastic mechanism to hold two batteries and an LED together rather shoddily. Is there an approximate date this will be back in stock? devlinse: Perhaps I'm using this wrong, but the head band is neither comfortable or particularly supportive and while it certainly magnifies effectively, the focal point is about 2" so it's no good for soldering - your nose is very close to the iron. As such it's very much an inspection tool. Perhaps I'm using this wrong, but the head band is neither comfortable or particularly supportive and while it certainly magnifies effectively, the focal point is about 2" so it's no good for soldering - your nose is very close to the iron. I use this all the time to check for solder bridges and read chip numbers.. very helpful with the small led light. I found the focal length to be pretty close to the eyepiece too so yea, you wouldn't want to use this to solder. What type of battery does this use? I was trying to look up what battery it was using too. Opening it up, it uses two Lithium Cell CR1620 batteries. How well does this work if you wear glasses? I think it will act like a microscope: you have go without your glasses and then adjust the distance of the item to the monocle lens to adjust the focus.